For the past six months, nearly every housing market measure has indicated improvement. The Twin Cities housing recovery is gaining momentum. What’s more, the recovery has shown signs of both depth (consistency and continuity) and breadth (improvement across numerous indicators). Below are a few statistics organized by topic that equate to market recovery. Numbers given are for August 2012 and percentage increases and decreases are compared to August 2011 unless otherwise noted. There were 4,877 pending sales, up 19.5 percent and marking the 16th consecutive month of increase. There were 4,883 closed sales, up 12.3 percent, marking the 14th consecutive month of increase. In June 2012, closed sales fell just 6 units short of a nearly 6-year high (70 months). 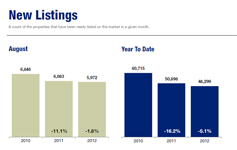 There were 5,972 new listings, down 1.8 percent but a slight gain from last month. There were 16,348 homes for sale, down 30.5 percent and marking the 19th consecutive month of decreases. Inventory levels are at their lowest since December 2003, which is nearly a 9-year low (104 months). Inventory levels have come down a total of 54.5 percent from their July 2007 peak. The median sales price was $179,000, up 15.5 percent and marking the 6th consecutive month of increase. The average sales price was $222,922, up 10.4 percent and marking the 7th consecutive month of increase. Categorical median sales prices shook out like this: traditional sales were $220,000, up 8.4 percent; foreclosures were $122,750, up 16.9 percent; short sales were $125,100, down 6.6 percent. Price per square foot was $104, up 9.3 percent and marking the 6th consecutive month of increase. The 10K Housing Value Index, which adjusts for both seasonality and housing segment bias, was up 8.1 percent to $170,656, marking the 5th consecutive month of gains. Foreclosures and short sales (“distressed properties”) comprised 32.4 percent of all new listings. Distressed properties comprised 35.1 percent of all active listings. Distressed properties comprised 36.0 percent of all closed sales.